“I’m running in the open to the million waves of joy“. Impromptu discovery, embracing curiosity and limitless freedom make a good theme for an album but even better if it’s also the production methodology. 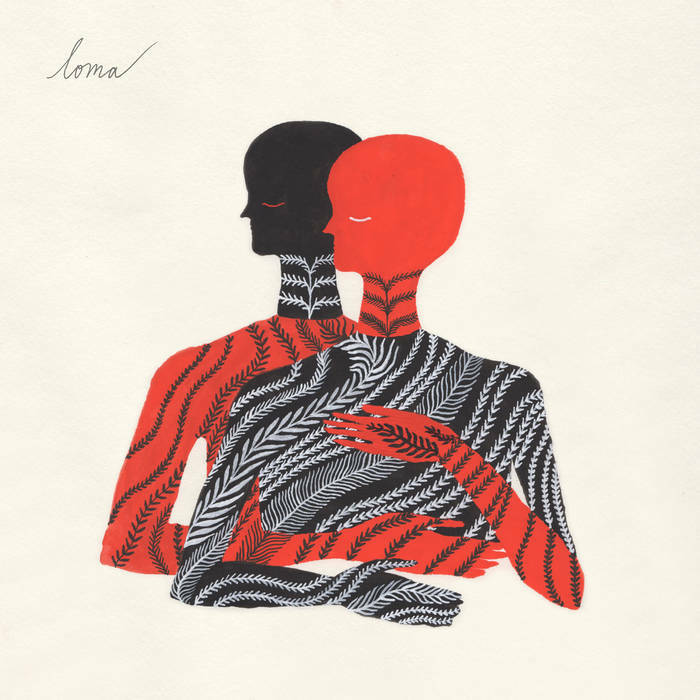 Recorded in a house off a dirt road in a rural part of Texas, the debut record from atmospheric-folk trio Loma is delightfully curious about its environment to both the point of observational and detailed note-taking of its animal, weather and skies but also its power to make a philosophical person ponder. Because listening to the self-titled release feels like undertaking a road journey with thoughts that grapple with independence (the reason for escaping a busier society) vs. dependence (still needing help to survive) in particular tracks such as’Relay Runner‘, ‘Shadow Relief’ and ‘Black Willow’. For those reasons, it feels like it could soundtrack the back-packing Reese Witherspoon-starring movie Wild about psychological rebirth. Loma itself is a collaboration project between three people. It combines the experienced songwriter and vocalist from prolific psych folk Shearwater (Jonathan Meiburg) – a musician that’s fascinated with nature, especially birds – with the ethereal atmospheric rock of Cross Record (Emily Cross and Dan Duszynski). They are a perfect fit because they both have a passion and an interest in reflecting their surroundings. Which is why one of the charms that’s brought to Loma’s debut album is its field recordings. From dogs panting and barking (‘Sundogs‘, ‘Shadow Relief‘), to whooshing wind (‘White Glass‘) to frogs and cicadas (‘Relay Runner‘), it’s really good at transforming the listener to their world. It compliments well the journalistic lyrics that also paint the backdrop. “I’m a black bird singing on a riverbank“, “Ice on the branches, the sun turned golden” and “The moon pulls the ocean back” are some good examples. Although these lyrics are sung by Emily Cross– whose calm guiding vocals within the darkness are reminiscent of Anna Ternheim at their most confident and Elena Tonra (Daughter) at their most shy – the lyrics are actually written by Jonathan Meiburg who attempts to imagine what Cross might think in a situation. This is particularly exploratory on a vulnerable song about motherhood entitled ‘Don’t Want Children’: “I won’t ever feel a warm head suckling me, feel my body swell“. It’s a risk writing for someone else, as it could come across as fake but Loma take chances and risks. They could have easily left tracks alone in the simplistic vein of José González, i.e straight-forward campfire acoustcs with thought-provoking lyrics, but instead they add psychedelic elements of stuttering tremolo loop pedals (which on ‘Relay Runner’ was part accidental), marxophone and fluty/mellotron sounds, as well mood-changing drums where the time signature shifts unpredictably to set the aura of the instrumentation. The final track on the album, ‘Black Willow’, truly encapsulates the measured connection between the collaborators with Emily Cross and Jonathan Meilburg harmonising in perfect synchronisation. However, it’s the trio’s attention to detail, willingness to express freedom and surrender to curiosity that really makes Loma memorable.